When searching for online MBA programs, you need to start with a baseline for quality. At the bare minimum you need to find a program that is fully accredited before you sign on the dotted line. Fully online MBA programs are awesome for price and convenience but as you look at the reality of piling on more student debt you need to know you’re making the right decision before you pull the trigger. Any school can hire a WordPress guru to make their site sparkle. But that doesn’t mean a thing when it comes to the brass tacks of the program. Just like with your undergrad degree, you should expect the school you choose to be recognized by either one of the six major regional accrediting agencies, or one of the few national agencies that accredit universities that offer their programs primarily online. This kind of university level accreditation covers all the basics—faculty qualifications, administrative processes, admissions, record-keeping. You’d be hard pressed to find an institution these days that hasn’t satisfied this fundamental requirement. When you’re looking at an MBA, though, you also want to make sure the program has a specialized accreditation going for it. A specialized business accreditation means that all the specific curriculum in accounting, management, and leadership unique to advanced business programs have been vetted and meet the most exacting standards. Each of the agencies have different strengths and weaknesses when it comes to how they make their assessments. For this list, we’ve hand picked only the cream of the crop IACBE-accredited online MBA programs. The IACBE is the most recently formed of the big three business accreditation agencies, but it’s nobody’s little brother. Established in 1997, it quickly achieved recognition from the Council for Higher Education Accreditation and stepped up to take on an equal role in certifying college business programs for quality and consistency. Today, it accredits members in more than twenty nations worldwide. IACBE accreditation is unique, however, in that it focuses on a different set of criteria than the AACSB or ACBSP. The IACBE looks at individual programs with a focus on student outcomes, making it somewhat more exclusive since only a select few programs from a quality business school might qualify for the IACBE stamp of excellence. In the eyes of the IACBE, student outcomes are the ultimate measure for assessing quality. Their job is to determine whether or not a program is effective in producing graduates with a true mastery of business subjects. As a smaller, newer accreditor, IACBE also creates options for smaller schools that the bigger, older agencies don’t necessarily cater to. A small, private liberal arts institution might have just as good a business program as a big state school, though it might not have the same kind of resources to throw into the accreditation process and all the red tape that goes along with it. IACBE is willing to work with those schools, looking more at what they achieve than what they achieve it with. While the other accreditors plunge deep into details about faculty background and research efforts at a school, IACBE focuses first and foremost on helping candidate schools develop an Outcomes Assessment Plan. The IACBE isn’t overly rigid when it comes to how a program turns out stellar grads, and makes it a point to allow for a certain level of flexibility in the way programs can meet their goals. This helps avoid a prescriptive, cookie-cutter approach to business education and allows IACBE-accredited institutions to innovate and maximize their efficiency. That can mean lower costs and more interesting approaches that fit your individual goals more closely than a big, impersonal program would. How Did We Choose Schools For This List? On this list, you’ll find the hidden gems of the American MBA field, the schools that try different things and succeed with them. 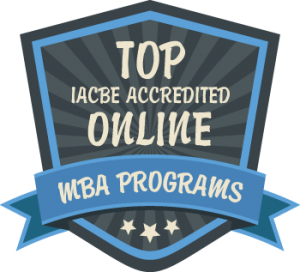 Based on a thorough review of all the options in the MBA marketplace, these are the IACBE-accredited online options we feel are really worth considering. We’ve taken pains to uncover those extra, unique features that might appeal to a smaller group of MBA candidates. Whether it’s a unique specialization that no one else offers, or a business partnership program in a field that few schools bother with, you’ll find it noted here. And when you find that program that gives you something that no other school can offer, getting accepted is like coming home again… you’ll end up with instructors who understand your learning style and fellow students who get you when it comes to the worldview you bring to the field of business. This level of understanding and camaraderie is what makes for the kind of supportive atmosphere and individualized learning experience that results in stellar outcomes. Here we serve up a list of nothing but the finest online programs. Some may include a trip to campus for an orientation or a mandatory collaborative project or two, but none have the kind of onerous on-site requirements that would ever throw a wrench in your work or personal schedule. Because all these programs are offered online, we made an extra effort to dig into the underlying technologies and methodologies used for delivering course content and getting you involved in projects and discussions. Online doesn’t mean the same thing from one business school to the next. You need to know, for example, whether classes are streamed at a particular time or are available asynchronously, at your convenience. We dive into the timing and course options so you know exactly what you’re getting into with each program. No matter what choice you make, you can be sure that an IACBE-accredited program will get your resume noticed anywhere in the modern business world. Simplified admission requirements, a fully online course of study, and a faculty of real world practitioners make Ashford University’s MBA program stand out from the rest. If you need a flexible and manageable courseload, Ashford’s MBA is certainly an option worth giving plenty of consideration to. This MBA program requires taking just one, six-week, online course at a time, so managing your full-time professional responsibilities while earning your MBA is never a problem. You’ll also appreciate Ashford’s 24/7 tech support, which offers immediate assistance any time, day or night. Complete the standard MBA or choose from one of the 13 highly relevant specializations to customize this 42-credit graduate course of study. Ashford University is accredited by WASC Senior College and University Commission (WSCUC), 985 Atlantic Avenue, Suite 100, Alameda, CA 94501, 510.748.9001, www.wscuc.org. National University’s MBA program will provide you with the education you need to hone your management, team building, quantitative and qualitative decision making, and creative problem-solving skills—all in a program delivered entirely online. Complete this online graduate degree and you’ll enjoy flexible, four-week classes that allow you to manage your professional responsibilities while completing your graduate degree. You’ll also have access to comprehensive student support services, so regardless of where you are or the time of day (or night), you can be sure you’re getting the assistance you need along the way. National University has a long history of success in online learning; more than 20 years, in fact, offering up the best in distance-based learning for adult learners like you. The online MBA at Wilmington University offers the flexibility you need and the academic rigor you expect. True customization is the name of the game here, thanks to your ability to choose from ten different specializations. Wilmington makes classmate and instructor collaboration easy with Blackboard, the school’s online learning platform which allows students and faculty to communicate via email, chat, and discussion boards. As an online student here you’ll be expected to participate 3-5 days a week, although the actual time of day is entirely up to you. Participate in class discussions, post assignments, and review faculty and peer feedback on your own time! And technical support is just a phone call or click away, thanks to the e-support portal through the university’s Technology Resources & Support. Whether you’re a recent graduate or experienced business professional, Saint Leo University’s MBA will provide you with an academically rigorous program that comes complete with curriculum delivered entirely online. As a proven leader in graduate business studies, Saint Leo offers a robust MBA that’s focused on advancing your skills in marketing, finance, management strategies, ethics, law, and human resources. You’ll also have the flexibility of customizing your grad degree by choosing up to two concentrations. Once you’ve earned your MBA, you may also complete an additional concentration, if desired. Just a few of the other perks of earning your MBA through Saint Leo include a faculty of experienced practitioners, expert support professionals to help you succeed, and a Student Life department that helps you collaborate and connect with your peers remotely through virtual student clubs and associations. Enroll any time and start your MBA on one of six, convenient start dates throughout the year! A fully online, completely self-paced MBA is yours at Hodges University! This 33-credit general business degree is designed to prepare you to succeed in any number of administrative and managerial roles in business and nonprofit areas. To complement this program, the university has partnered with a public relations expert to guide students through the steps they need to take to build a powerful personal brand. As a student here, you’ll work alongside highly qualified professors with significant field experience who bring their real-world experience to the classroom. In addition to an outstanding admissions team that will guide you throughout the enrollment process, you’ll enjoy superb online support, collaboration, and communication through Blackboard, the university’s online learning platform. Just a few of the features of this platform include instant messaging, virtual office hours for instructors, recorded lectures, and real-time conferencing. As a leader in online and distance education, Thomas University knows what it takes to produce quality, online programs for adult learners. Its 33-credit MBA is a fully immersive online learning experience build on the Dynamic Learning Environments platform. As a student here, you’ll work through Canvas, a course management system that will allow you to download course material, submit assignments, interact with instructors and peers, and participate in group collaborations. Not an undergraduate business major? No problem! Thomas offers a unique, online workshop that allows you to satisfy the undergraduate requirements necessary to enter the program in just eight weeks. As a leader in graduate management education for more than 40 years, Chaminade University understands what it takes to produce graduates that go on to become effective managers who lead people, projects, and organizations in nearly any type of business setting. In addition to popular concentrations in the areas of accounting and not-for-profit management, Chaminade also offers a concentration in Island business, which is designed to build on the MBA core and prepare graduates to better understand the challenges facing Hawaii, its land, its people, and its economy. Chaminade makes use of Canvas, a highly interactive learning platform that will allow you to communicate with your peers and instructors, receive course materials, and attend online class sessions. North Park University’s fully online, 36-credit MBA program is designed for experienced business professionals like you, thanks to a contemporary curriculum that covers topics like financial decision making, strategy for competitive advantage, and marketing analysis and consumer behavior. In addition to the 13 core courses of this program, you’ll also complete 5 electives courses that will provide you with the opportunity to personalize your graduate course of study in an area of interest. Plus, North Park offers a variety of graduate-level certificates which, when taken alongside your MBA, will add a specialized focus to your grad degree. Choose this online MBA and you’ll be able to complete coursework according to your schedule, with no specific weekly class times. You’ll also receive excellent support and guidance throughout your online program courtesy of the Center for Online Education, which administers Canvas, the university’s online learning platform. Looking for a truly customizable MBA and a fully online course of study? Look no further than Indiana Institute of Technology’s MBA program that features online classes in an accelerated, interactive format. With six-week classes and the flexibility of studying wherever and whenever it’s most convenient for you, Indiana Institute’s MBA is perfectly suited for adult learners like you. You’ll also be guided along the way by an expert faculty of practitioners with extensive experience who bring their expertise to the classroom. As a student of Indiana Institute of Technology, you’ll enjoy assistance from your personal admissions representative, technical support through the Warrior Information Network, free tutoring through the Office of Student Success, and comprehensive career services through the school’s Career Services Department. Maharishi University of Management’s Online MBA in Sustainable Management is a truly contemporary course of graduate study that’s designed to educate students on the ins and outs of supporting a profitable business that offers life-sustaining products and services. This fully online, 60-credit program can be completed in six semesters, including two summer extensions. You’ll begin this program with a four-week Science and Technology of Consciousness course, where you’ll explore deep principles for holistic development of body, mind and consciousness. Thereafter, you’ll begin each semester with a two-week Forest Academy, where instructors guide students through a reflection on business. All online courses are held on Tuesday and Thursday evenings and Saturday mornings. While you can participate synchronously, the courses are also recorded if asynchronous learning better suits your schedule. The unique cohort model allows you to take just one four- or eight-week class at a time for the best in flexible, distance-based learning. Grantham University’s MBA offers the best in flexibility and convenience for adult learners like you. Choose a general MBA in a standard or accelerated format (taking two classes per term instead of one) or take your MBA to the next level and specialize in Information Management or Project Management. If you’re an experienced business professional with an undergraduate degree in a business-related field, you can pursue the accelerated pace MBA program. Complete the standard MBA and you’ll finish this 37-credit program in 24 months; choose the accelerated option and you’ll be finished in just 12 months. Choose Grantham’s MBA and you’ll also have ample access to the school’s Teaching and Learning Center—home to a variety of student resources and assistance, including tutoring sessions, tutorial, live chat sessions, webinars, and more. Earn your 36-credit online MBA through Campbellsville University and you’ll be part of a program that’s been recognized among the top 100 online MBA programs by U.S. News & World Report! With a fully online delivery format supported by faculty members with real-world business experience, this MBA offers everything you need to serve as a committed and highly capable business leader in a variety of business environments. Want to take your MBA to the next level? Choose from one of the concentrations available at Campbellsville so you can learn skills unique to your field. Or, simply round out your graduate course of study by choosing electives that best meet your career objectives. As an online student here, curriculum will be delivered via Moodle, the school’s innovative online learning platform. You’ll also enjoy comprehensive technical support, an online library, and full career services through the Office of Career Services. The Capitol Technology University MBA program features a robust core, along with related projects designed to build upon your current skills while you grow as a leader and hone your understanding of the latest in business technology. You’ll complete this 36- to 39-credit program through a combination of fully online, accelerated, 8-week terms and 16-week semesters. As a business student here you’ll work alongside a faculty member to develop a project-based research paper that draws on your education and personal experiences. As if that level of individual attention isn’t impressive enough, you’ll also collaborate with fellow students under the guidance and support of a faculty made up of experienced business professionals. Plus, the unique curriculum schedule allows you to begin classes six times a year for the best in flexibility. Husson University’s MBA is a fully online course of study that is complemented with relevant business concentrations for today’s dynamic business environment. This comprehensive program features a core of 24 credits, along with 12 hours in a concentration or electives of your choice. Thanks to the fully asynchronous format, you’ll work on your own schedule, which makes it easier to juggle personal and professional responsibilities while you earn your graduate degree. You’ll also have plenty of support as a student here, thanks to Career Link and College Central Network, among other outstanding services offered through Husson Career Services. Pursue Fisher College’s Part-Time MBA and you’ll enjoy a fully online course of study with a focus on strategic leadership and the practical application of business know-how. As a student here, you’ll work in small student teams while you complete experiential learning activities that involve solving real-world problems based on real business cases. The Part-Time MBA is completed through three, 12-week terms and one summer, 8-week term, so you’ll earn your 41-credit MBA in just two years. The fully asynchronous program means there’s no need to attend any regularly scheduled classes; instead, you’ll complete them when it’s most convenient for you. While this program is offered online, you’ll always have access to instructor assistance and support when you need it, along with a fully staffed Student Support Center when technical questions arise. Davenport University is a leader in business in Michigan, offering a robust selection of undergraduate and graduate programs, including its esteemed MBA. Choose from the general MBA program comprised of 30 credits (with a concentration) or earn a graduate certificate alongside your MBA and you’ll complete 39 credits. Either way, you can complete this fully online program in just five semesters. You’ll also benefit from the seven-week classes that begin six times a year for the best in flexibility and convenience, along with options to study abroad or complete an internship. Choose the 12-month MBA and you’ll be able to complete your MBA in just a year, thanks to predetermined scheduling that involves taking two courses during each seven-week session. Other reasons to put Davenport on the top your list include the world-class instructors with real-world experience and the innovative online learning environment that employs a variety of technology tools for the best in asynchronous learning. If you’re looking for a university with a proven record of student success, look no further than Lawrence Technological University, named one of the best universities in the Midwest by the Princeton Review. Lawrence Tech’s MBA builds upon this university’s history of academic excellence, combining a dedicated and highly engaged faculty with cutting-edge, fully online curriculum specifically designed for adult learners like you. Study whenever and wherever it’s most convenient for you and you’ll have your MBA in hand in just two years. You’ll enjoy frequent contact and collaboration with faculty while you develop the leadership and management skills you need to become a business leader in any industry. Want to take your MBA to the next level? Consider adding an optional, high-demand concentration to further enhance your field-specific expertise. Belhaven University’s Online MBA is a rigorous, contemporary course of study that’s designed to accommodate the needs of adult learners like you. The online courses that comprise this program are delivered in manageable, eight-week terms, and project-based activities encourage collaboration with your peers. In addition to the program’s core, you can personalize your 36-credit program through the choice of a concentration in one of four areas. Other than adhering to weekly assignment due dates, you’ll study on your time, whenever it’s most convenient for you. As an online student here, you’ll enjoy plenty of support from Belhaven’s online staff and professors, which includes a dedicated Student Services Representative and access to BlazeNet, the university’s online student information system. Wayne State College’s MBA is a 30-credit, fully online, non-thesis program that’s perfectly designed for today’s busy professionals. In addition to the program’s 24 core credits, you’ll also choose from two electives to round out your program and focus on your career objectives. You’ll be able to choose electives that focus on government and industry, international business, leadership ethics, project administration, and more. While you’ll be studying at a distance, you’ll still enjoy plenty of interaction with your professors and peers, thanks to an interactive learning environment, comprehensive course management software (Sakai), and online discussion boards and chats. Are you a working adult or other nontraditional student? Then Excelsior College has the MBA for you! This fully online graduate program is designed to allow you to maintain your personal and professional obligations while working toward your MBA. Complete the MBA through Excelsior and you’ll choose from either a general MBA or a concentration in a contemporary and highly relevant area of business. As a student here, you’ll also have access to a community of knowledgeable instructors, academic advisors, career counselors, and coaches for the best in online support. Depending on your prior learning, your MBA will consist of between 36 and 45 credits. Non-business majors generally need to complete undergraduate courses in economics, organizational behavior, and quantitative analysis prior to entering the program. Forty-eight credits delivered in convenient and manageable seven-week terms are at the heart of the fully online MBA at Medaille College. As a student here, you’ll work alongside a dedicated faculty of real-world practitioners from the business community. Thanks to an asynchronous learning environment, you’re free to take in course content and complete your work on a schedule that works best for you. Medaille’s MBA has convenient start dates in the fall, spring, and summer, so you won’t have to wait long to get your graduate degree underway. Choose Medaille’s Student Choice Schedule and you’ll have the flexibility to take anywhere from one to four courses a semester so you can make sure the program never conflicts with your personal and professional responsibilities. Other perks of the MBA include small class sizes, a collaborative learning environment, personalized attention from professors, and the support of a personal success coach as you work toward completing your MBA. Admission requirements: Applicants must have a minimum undergraduate GPA of 2.5, or 2.75 during the last two years of the program, or 3.0 in their major. GMAT not required for acceptance; however, it must be completed prior to MBA-specific classes. In lieu of taking the GMAT, students may take three preparatory classes in finance, accounting, and economics. An accelerated course of study, nine optional areas of concentration, and a fully online course of study are just the beginning of what the University of Mary’s Online MBA has to offer the adult learner. Interested in flexibility and convenience? Most courses start every five weeks, year-round, so it’s always a good time to start your MBA. While course content is delivered entirely asynchronously so you can study on your own time, you’ll still be able to collaborate with your fellow students through Canvas, a highly interactive online learning platform the school uses. Online students here get lots of support with everything from academic advising services to counseling services to online tutoring services, so you’ll always feel supported throughout the program. Lake Erie College has a long history of producing business leaders. In fact, it’s been offering the MBA since 1981. Since then, the college has produced more than 1,500 business leaders. Lake Erie College’s fully online, 36-credit Parker MBA is a truly convenient alternative to the college’s on-campus MBA—same coursework, same faculty, same high-quality degree! Recently introduced in 2017, the Parker MBA features a set curriculum path, a user-friendly learning platform (Lake Erie Online), and two courses per term. Complete this graduate program and you’ll earn your MBA in just two years. Designed as a general MBA, the Parker MBA can be specialized through your choice of electives or by selecting from one of three high-demand concentrations. Oklahoma Wesleyan University’s MBA is where adult learners head for the best in convenient, flexible learning. This fully online program is designed for students like you who require the flexibility that distance learning provides. It also includes the option of specializing in management, finance, marketing, organizational leadership, or nursing management, so you can focus your graduate degree on your specific career goals and professional interests. Thanks to academic advisors who are there to guide you throughout the program, and course schedules that include just one class at a time, going back to college to earn your MBA has never been easier. The collaborative, online learning environment ensures plenty of interaction with faculty and peers, although the synchronous design of the program means you’ll study whenever it’s most convenient for you. Eastern Oregon University’s online MBA is a mirror of their on-campus program, promising a high-quality, intensive course of study where you’ll focus on no more than three courses each term. This 45-credit degree features a core of 30 credits, as well as 15 credits in MBA electives. Elective options like Alternative Business Strategies, Disaster Recovery and Business Continuity, and Taxes and Business Strategy allow you to seamlessly integrate your professional interests or goals into your MBA program. You’ll be supported throughout the process, thanks to a dedicated staff of personal coaches who will work with you from admissions to graduation. You’ll also have the flexibility of completing your MBA in as few as 15 months or as long as four years. Spring and fall start dates mean you’ll never need to wait long to get started on your MBA! Point Park University’s 36-credit MBA program is the fully online, academically rigorous course of study you’ve been looking for! This comprehensive program prepares you to become a competent and respected business leader, covering topics that range from critical business concepts to ethics to international finance and business law—all in a fully online format that’s designed to accommodate your personal and professional obligations. As a student here, you’ll also benefit from Point Park’s superb faculty of experienced practitioners and its supportive online environment, which provides the kind of exceptional education experience that helps assure success. Salve Regina University’s fully online MBA will prepare adult learners like you to lead effectively in today’s dynamic business environment. This 36-credit, customizable MBA features a comprehensive core that can be specialized with your choice of one of five highly relevant concentrations. You’ll also choose from two elective courses to round out your MBA and allow you to focus on your professional interests or goals. But that’s not all—you’ll also benefit from the same outstanding support services that on-campus students enjoy through the Center for Student Development and the Office of Career Development. The MBA at Charleston Southern University is a program designed to meet the needs of today’s busy working professional. This 33-credit program features a comprehensive course of study, along with your choice of six distinct emphases in some of the most popular and high-demand business niches. You can also choose from a broad array of electives to create a truly customized learning experience that best aligns with your specific career goals and personal interests. Just a few of the reasons why Charleston Southern’s MBA stands out from the crowd include: a highly esteemed Christian faculty committed to teaching cutting-edge business principles…a spot on U.S. News & World Report’s list of the best MBA programs for veterans…and an asynchronous learning environment that allows students to meet weekly assignment deadlines on their own time and according to their own schedule. This 33-credit program also accommodates students lacking knowledge in specific business areas by offering prerequisite courses before entering the program. Dakota Wesleyan University’s online MBA is the ideal program for students with geographical limitations or professional obligations that make attending classes on-campus difficult or even impossible. This fully online program features flexible courses that can be completed on your time, at your pace, without ever coming to campus. The accelerated, eight-week courses suit adult learners like you, and the flexible calendar features three start dates a year, so you’ll never need to wait long to begin your MBA. As a full-time MBA student here, you’ll complete two courses at a time, which allows you to finish your MBA in just 12 months. You can also complete it on a part-time basis, if desired. If you don’t have an undergraduate degree in a business-related field, Dakota Wesleyan can get you quickly up to speed through the completion of self-paced modules. Full-time or part-time, you’ll be able to complete the MBA program at Southern Adventist University in a fully online format that accommodates your personal and professional obligations. Choose a full-time course of study and you’ll complete your MBA in one year; choose the part-time program and you’ll earn your MBA in two-three years. You’ll have the option of completing your MBA as a general degree, customizing it with your choice of electives, or focusing your MBA on Accounting, Healthcare Administration, or Management—the choice is yours! You’ll also have full access to the university’s comprehensive student and career services, along with access to online courses through Southern Adventist University’s Course Management System, eClass. Concordia University’s fully Online MBA program features a comprehensive course of study in contemporary business topics that’s led by professors with industry experience. Just a few of the perks of Concordia’s MBA program include: a focused curriculum that covers the core principles of business in depth … asynchronous delivery that allows you to complete course content when it fits your schedule … accelerated, eight-week courses that feature case studies and practical projects … the option of completing a general MBA or specializing … and online support available 24/7. Since 1926, Concordia University has been producing successful graduates, and their Online MBA program is no exception. West Liberty University’s Online MBA offers the flexible course of study you’re looking for and the academic rigor you demand. This fully online program features 30 credits delivered in a convenient, asynchronous format to accommodate busy, working professionals like you. You can complete this program in as little as 12 months by taking just two courses per seven-week semester, or at a slower pace by taking one course per semester. Once admitted to the program, you’ll take the Inbound Placement Exam and then complete the appropriate online leveling module(s) to prepare you for the MBA. Connect with your peers through forums/discussion boards, ask questions on the FAQs forum, or gather informally with your peers in the Coffee Chat area—there’s many ways to collaborate and connect as an online student at West Liberty University. If you’re looking for a fully online MBA that’s also fully customizable, Herzing University is for you! Their online MBA, which features a core of relevant business topics, including critical thinking skills, career advancement, and more, can be specialized in one of seven areas; you can also choose a dual concentration option if you want to take your MBA one step further. Plus, the completion of a capstone project, designed to demonstrate your mastery of the coursework, rounds out this comprehensive course of study and ensures you’re well-prepared to serve as a leader in today’s dynamic business environment. Don’t have an undergraduate degree in a business-related field? No problem! Herzing offers unique, business-leveling courses to get you up to speed. As a student here, you’ll also enjoy access to the university’s wide academic support resources and tutoring services.